Natural bed bug treatments are often the debated first choice for use of many victims with infested dwellings before they decide to spend the extra money on a professional bed bug exterminator. It is commonly known that bed bugs cannot survive in high temperatures, therefore applying steam directly to the key areas can be very effective. You can steam your mattress, pillows, and other soft furniture at a temperature of 120 degrees or above to kill the bugs and eggs. Keep in mind that steaming only works when hitting the infected areas directly, and there is still a chance these bugs may survive in the corners of your bed frames. It is important to be thorough and try to get the steam into each seam, the ideal hiding place for them. Vacuuming everything can help in eradicating these bugs, especially if they exist in larger numbers. Bed bugs can be anywhere, so you need to be certain that you cover everything, with a main focus inside and around the bedrooms. Their small size and flat structure allows them to hide in the tiniest cracks, and if too deep, the vacuum nozzle may not be able to get close enough to apply the amount of suction needed. Also important to note, you’ll want to use a bagged vacuum only to allow the sealing and easy disposal of bag afterwards. As mentioned above, high temperature kills bed bugs and their eggs instantly. You can dry your clothes, bed sheets, curtains and other washable items to treat the infestations. This also has limited results, and should only be used as one part of other treatment methods. Considered one of the best natural bed bug treatments, this is a low cost chemical-free powdered substance that can be used as a barrier and/or to insert in holes or cracks where bed bugs might be crawling. 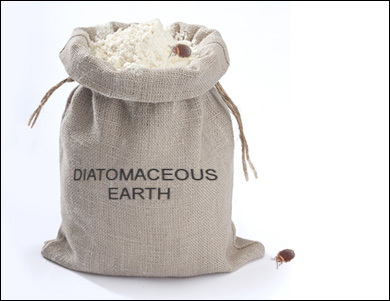 Diatomaceous Earth works by absorbing the fats and oils from the bodies of bed bugs, essentially leading to their dehydration and death. One of the key spots to spread this powder is in the electric wall outlets. Bed bugs use the outlets to get from one room to another, or to a different floor of the dwelling. These natural bed bug treatment methods are the best available home remedies in controlling a beg bug infestation. Although all of these natural treatments work to some degree, it doesn’t mean that they are enough. Depending on the level of infestation, a pest control company will effectively use a combination of multiple techniques as listed above, plus apply a pesticide treatment with a long lasting residual effect. This residual application is designed to eliminate any wandering bed bugs that may have escaped into a wall, or another room. Swift-X Pest Control offers a professional team of bed bug exterminators in the Toronto area to treat your home with affordable rates, and a 3 month warranty that guarantees elimination. Give us a call today at (647) 478-2128 to discuss your current situation.